The small peg that holds your golf ball on the first stroke play an important role in getting your game off on the right start. You want to use the right kind of tee for your play style and ensure that you are able to hit the ball full on for an accurate shot. Using the wrong peg can cause you to miss your shot, slice or hook the ball. We’ll show you what the best golf tees can do for you and how you can pick the right one. We have shown you how to find the very best golf tees, and now we want to show you some of the best. We hope one of these will work well for you. You can’t really do any better for cheap, quality tees than these from Pride Professional Tee System. They are strong wooden tees that hold up pretty well to a beating from your drivers. There are enough of them in the bag that you can play for a long time, even if you do break or lose a number of them. Their 3 ¼ inch length will be just right for most players, but the balance could be better. These have such a small surface area on the top that your ball may not be perfectly stable, and that’s worth considering if you are comparing your options. Not very stable ball balance. 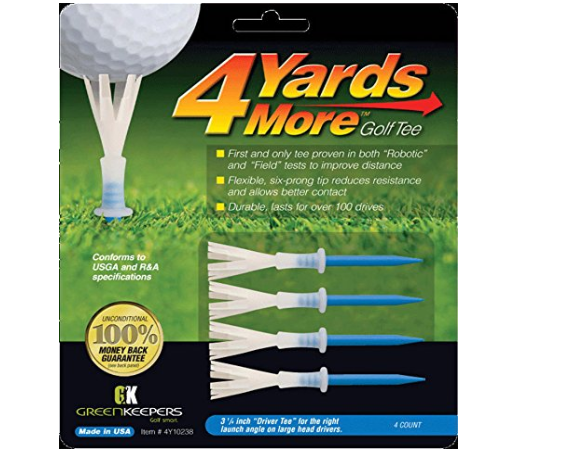 This is a smaller set of tees, and it has a small upper surface area, but it’s a great value. 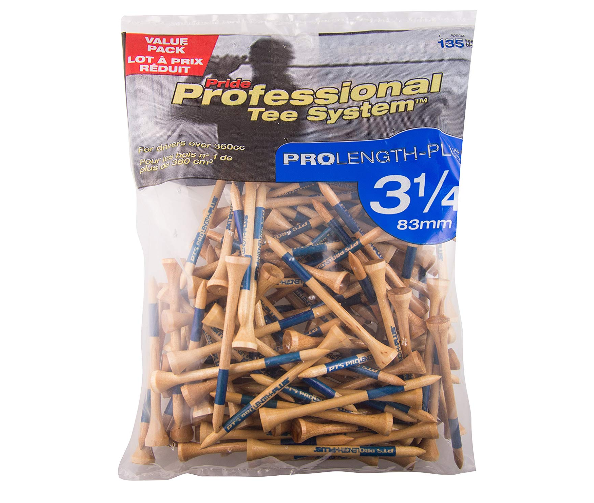 You get 100 tees for less than $10, and these small, wood pegs are very simple to use. There is nothing fancy or special about them, but they are practical and functional and well worth the small price tag. Since they are so colorful, that makes them easy to pick out and to find when you hit them away. They also help with eye-hand coordination, as players can easily see where the tee ends and the ball begins. Gives you plenty of value. 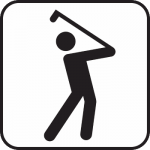 Callaway is one of the top names in golfing equipment, and their very affordable tees are a great addition to their line-up of merchandise. They offer these in a 100-pack, and the tees come in different colors and sizes, so you can pick exactly what you need. These are not very durable, but they are pretty stable and are easy to push into the ground. There is nothing complicated or expensive about them. They are simple, competitively priced tees that offer you some decent value. Priced to offer great value. Easy to see due to their different colors. You can pick from tons of bright colors with these tees, and they are a bit more stylish than their competition. That means they also cost more, but at the same time, they should last longer as well. It’s a tradeoff you might be okay with, but you need to know how these compare. The heads are about standard size, offering some okay ball stability, but nothing fantastic. You only get a handful of tees per bag, whereas you can get dozens of other lower quality tees for the same price by purchasing from another brand. It’s up to you how much you want to pay and how much value you will get out of these tees. 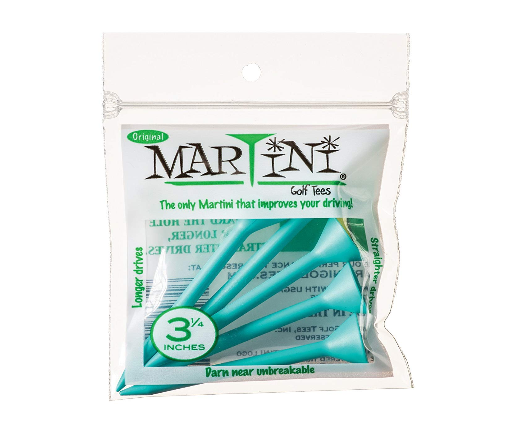 We wouldn’t recommend them to anyone who loses tees often, but if you are tired of yours breaking apart after every stroke, then you might want to give these a shot. Very strong and made to last. Colorful design makes them easy to find. You only get four to a pack with these tees, but they are high quality products that are designed to be durable instead of disposable. The extra cost may be worth it due to how well they work and their specialized design. 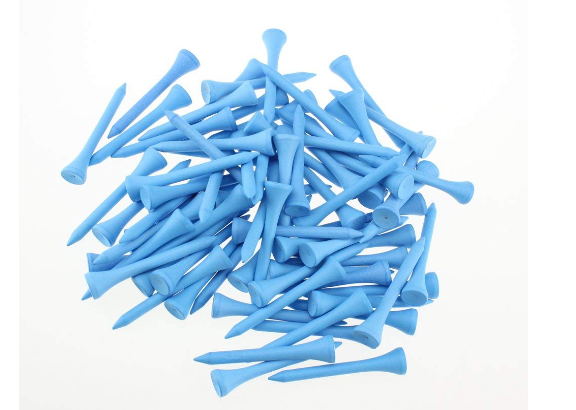 These are not your typical golf tees, as they come with a multi-tip prong that holds the ball and keeps it stable while reducing friction and contact. That can get your ball moving faster, but the difference will only be minor, so consider that as you think about paying the extra money for this pack of tees. Most people don’t realize that these little tees can affect their game, but it’s true. 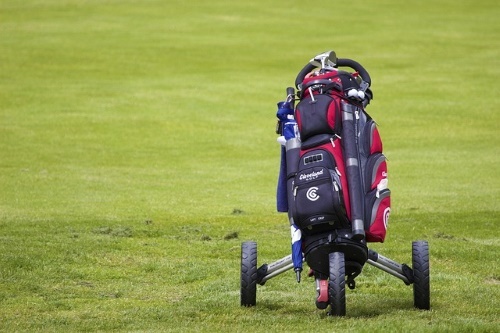 Some golfers even forgo the tee entirely, but Travel Golf recommends you use one whenever you have the opportunity. It may seem like a small and insignificant part of the game, but the tee plays a vital role in starting off the game and ensuring your first shot goes where it is supposed to. That first stroke sets the tone for the rest of the game. If you miss the shot to hit it somewhere you did not mean to, then that can destroy your focus and concentration and really hurt your morale for the remainder of the day. If you choose the wrong tee, you could have trouble getting it to stick into the ground or hold your ball straight. You don’t need to put as much thought into the tee as you would in a driver, but it’s still something that should be given some consideration. You can’t let anything throw off your game, no matter how little, so take the time to choose a proper tee that will help you get that first ball where it is supposed to go. Length- How long a golf tee is determines how high off the ground it will be when you hit your ball and how deep it can go into the ground. Longer ones are usually better, since they help make the ball more stable as you push them deep into the ground, but you’ll need to figure out your preference. The size of your driver also affects your tee choices, and Golf Circuit advises you to pick four-inch tees for large drivers and three and a quarter-inch tees for hitting small drivers. Shape- Tees come in a variety of sizes and shapes. You can get ones that hold your ball in a bowl-type setup, while others give you greater stability or make it easier to push the tee into the ground because of their shape. Corkscrew tees, for example are pretty easy to get into even hard ground, and tripod-shaped tees are incredibly stable. Materials- Tees tend to be made from either wood or plastic. Most people who have been playing a long time have their preferences, but what should a new golfer go with? The material can have some small effect on how quickly the ball leaves the tee, according to Golf Digest, and it can also affect friction, durability and environmental friendliness. Durability- Wooden tees are more likely to break than plastic tees, but there are some very low quality plastic ones as well, so take time to look at reviews and see how durable the tee is before you put down some money for it. Short Tees- It’s usually best to go with longer tees, but personal preferences will play a role in determining the best tee size for you as well, says Sports Rec. If your tee is very tall, you can always push it deeper into the ground. It’s the shorter tees that you need to be careful about picking, since they offer limited options for height. Expensive Tees- This is a simple piece of equipment that you don’t need to overthink. If you are being charged more than a few dollars for yours, then you are overpaying for it. There are tees that can cost upwards of $100, and those are extravagant and unnecessary, but some golfers have money to burn. If you do not, then stick to the inexpensive ones that work every bit as well as something that costs a lot more. Novelty Tees- There are also a number of novelty golf tees that are more distracting than useful. Some of these are not very stable or easy to use, but they might be good for a laugh. Just don’t expect them to help you hit straighter or farther, since they are made for laughs more than functionality. Buying One or Two tees- You can buy tees by the bag, and why shouldn’t you? They are typically cheap and disposable, and if you lose one or break one, you have more to pick from. If you are buying individual tees, you are probably overpaying too, so be sure to compare your options to make sure you are getting a decent deal. There you have it. That’s our guide to finding the best golf tees, and maybe when you go to pick out this small piece of equipment, you will give it a bit more thought and feel more informed about what one to go with. 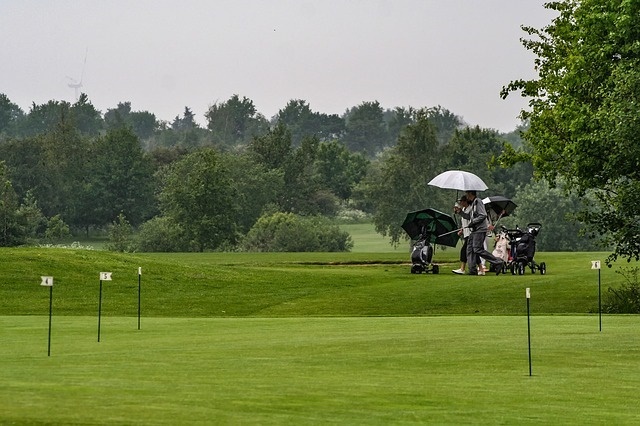 There are other in-depth guides like this one on our site, so be sure to look through those if you need additional help in picking out golfing equipment.